The FIDE website reports that Nadezhda Kosintseva has withdrawn from the Grand Prix Series. According to the announcement, she has been replaced by her sister Tatiana Kosintseva due to the rating criteria. Let us remind you that Tatiana has already participated in the 1st stage of the Grand Prix and shared 3-4 places. The sixth round of the Women's Grand Prix Series stage is under way. 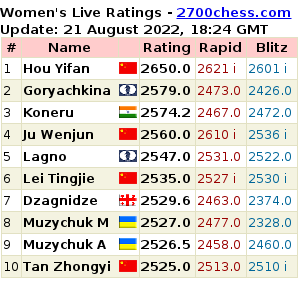 The leaders Anna Muzychuk and Elina Danielian have white pieces against Alexandra Kosteniuk and Nadezhda Kosintseva, respectively. You can watch these and other games live. 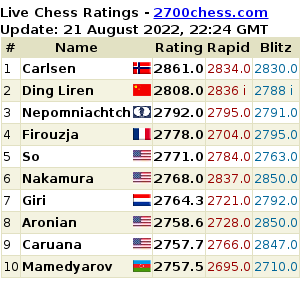 Yesterday we have published the table offered on the official FIDE website; the participants of the Grand Prix as well as the host cities of the different stages have been mentioned in it. We promised to update you with any changes which could have taken place, but we couldn't actually imagine that we had to inform you about such serious changes right on the next day.